Welcome to the wonderful world of Whippets! Great news! Lure coursing is now an ANKC recognised sport! So what is Lure Coursing??? Lure coursing is a performance sport developed in the early 70's by sight hound fanciers who hunted jackrabbits in the open field. 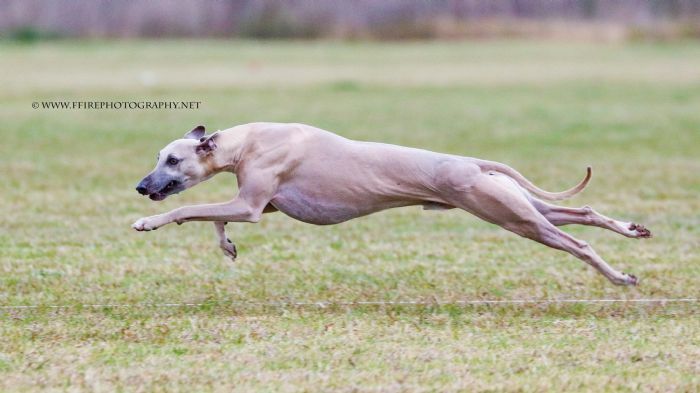 They invented lure coursing as a safer, more controlled sport for sighthounds that would recreate the physical requirements of open field coursing, allowing them to continue testing the functional abilities of their hounds without using live game. The hounds chase plastic bags that are pulled around on a nylon string course, propelled by a hand controlled motor. A lure coursing dog should have the ability to run without showing signs of undue stress or lack of fitness. Lure coursing tests many aspects of a dog’s physical structure and temperament. As a consequence, dogs who participate in lure coursing need to be sound, not overweight and fit. Lure Coursing is open to all ANKC registered breeds, and to dogs which are registered on the Associate Register. Your dog must be registered before it can participate in a trial. What titles can my dog earn? This depends if your dog is in the sighthound stream or not. If your dog is in the sighthound stream you will start by earning your Junior Courser title and then have the option of entering 3 streams – single stakes, veteran stakes (if old enough) or open stakes. If your dog is another breed or an associate you will also start by earning a Junior Courser title and then move on to compete in the Coursing Ability stream to earn Coursing Ability titles. For more detail, see the rules available on the ANKC website. Yes. Your dog must be 12 months old to run in the Junior Courser Tests and Coursing Ability Tests. It must be 18 months old to run in the other stakes. Does my dog have to wear a muzzle? Not unless it has been disqualified for interfering with another hound or for showing aggression to another hound in multi dog stakes. If you wish, you can choose to muzzle your dog. Not unless your dog is in the Sighthound stream and you plan to run your dog in open stakes (ie, with other dogs). If that is the case, when your dog has qualified as a Junior Courser you will need to purchase “blankets” (racing jackets) for your dog in the recognized colours of blue, yellow and pink. The field is within a fenced complex but it is not fenced. Training an effective recall will help make your participation in the sport stress free. Do I need to buy a slip lead? No, we can show you how to use an ordinary lead as a slip lead. Of course, if you like buying leads, go ahead! Please note that your dog cannot run in any kind of collar or harness.